1. What are sigils and what do they do? 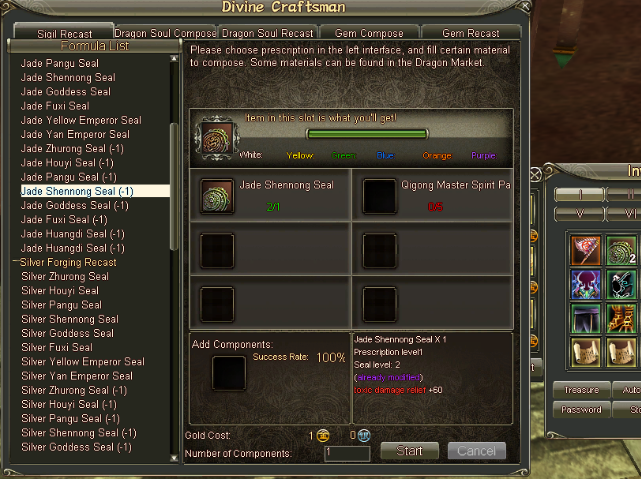 Sigils, or seals, are items in the game of Loong that you can add to gear in very much the same way as you do gems. Each sigil offers you resistance against a particular form of attack, for example, bleeding resistance against sword attacks, or toxin resistance against healer attacks. For example these four sigils shown here offer 100 points of resistance against heavy blow attacks each. And these sigils, which are of a lesser quality, offer 60 points of toxin damage resistance each. 2. How can i get sigils? You can obtain some sigils from questing in Loong, for example they are sometimes given as a reward from normal quests, or also they are one of the possible rewards given by the repeatable “New Year” quest. However by far the easiest way of obtaining sigils is via the “Dismantle” skill. As well as dismantling items for materials, the Dismantle skill also has a second tab called “Reveal” You can reveal any weapon or armour that is higher than level 30 and at least of yellow quality, to try and gain a sigil. 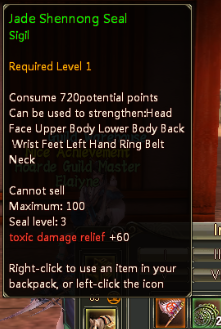 The higher the level and quality of the item, the better quality sigils you have a chance of revealing. Once the item has been revealed, it will be lost. The image below shows the “reveal” tab. I have placed a level 90 blue quality totem into the revealing window, and you can see that revealing this item will give a guaranteed Gold Fuxi seal (sigil) , with a 33% chance of a Gold Yellow Emperor seal (sigil) as well. You also have the chance of gaining some quench materials, and good to note here also is the error in the “Surging” which is listed at 100%. Surging items are Dragon Soul items, and the % chance of gaining them is incorrectly displayed in the reveal interface. The real chance for receiving one of these is actually very low, so bear this in mind when revealing your items. 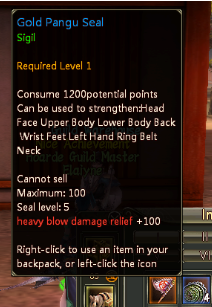 Just as with any other tradeskill profession in Loong, dismantling and revealing will cost you vitality, as you can see in the image, revealing this will cost you 35 vitality. Many of you will be interested in obtaining seals of a very particular type, as you wish to sigil your character against say, bow attacks , or internal damage. Please reference Appendix 1 for a table with information on what items you need to reveal for sigils of particular types. 3. What are the pros and cons of using sigils? 1. Sigils give you the option to customise your armour to be effective against any class you wish. 1. Modifying sigils to reduce their potential can be very expensive. 3. Unlike with gems, sigils CAN fail when applying them, so there is an element of risk involved. 4. Unmodified sigils use up an extremely high amount of potential. 5. The lowest level sigils also give minus resistances. 4. How to Modify sigils. Many sigils use up an extremely high amount of potential unless they are modified. In order to modify them, you can visit the Divine Craftsman. The first tab in his window is named “Sigil recast” and he has a wide range of options for reducing the potential on seals. Note however that you cannot reduce the potential of Level 1 seals as they already use up the minimum amount of potential for a sigil, which is 320. I have chosen to insert the Jade Shennong Seals from my previous screenshot into the Sigil Recast window here, and you can see that the cost is 5 x Qigong Master Spirit Papers. The higher level a seal is, the more options you have for reducing the potential cost on it, but bear in mind that the better quality of recast you carry out on your sigil, the higher the end cost will be. 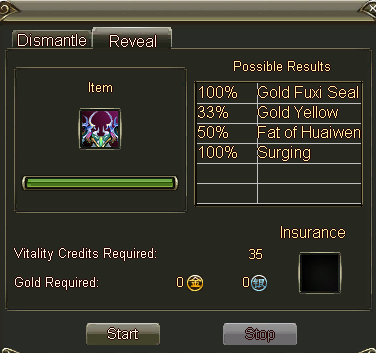 For example, to “triple modify” a Gold Shennong Seal to use only 320 potential will cost 12 Temple Spirit Papers. 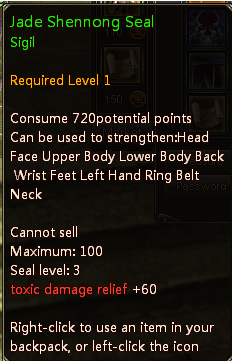 The number of sigils you can attach to your particular piece of gear depends on the “Level “ of the sigils you wish to attach as well as the potential amount you have available on your item..
No piece of gear can have more than a total sum of 10 sigil levels on it. Let’s look at my Jade Shennong Seal again in more detail. So if you had five level 2 sigils, you would be able to attach five of those into the same piece of gear, assuming of course your gear had enough potential for that many. It is important to note here, what when you modify/ double modify / triple modify (or as it is labelled at the Divine Craftsman, “ recast” ) sigils down to reduce their potential cost, you also reduce their level.